Alternate gridwork is a part of the definition of modern quilting according to the Modern Quilt Guild. The other parts (negative space, improvisation, solids, etc.) garner a lot of direct attention; alternate gridwork is a bit mysterious and worth looking at more in detail. If you'd like more info, you've come to the right place! I've also included resources at the bottom for your convenience. I personally believe there are a thousand definitions of what a modern quilt is, but I definitely think that alternate gridwork is one of the easiest and clearest to modernize a quilt design. Primary Improv Rainbow - my original design featuring wonky crosses - keep reading for more on the rule of thirds. One of the most inviting parts of alternate gridwork: it's totally doable with traditional blocks (like in the quilt above). All you have to do is think outside the box! Plan it out. Use graph paper or software. Get a quilty friend to weigh in. There are billions of exciting options! 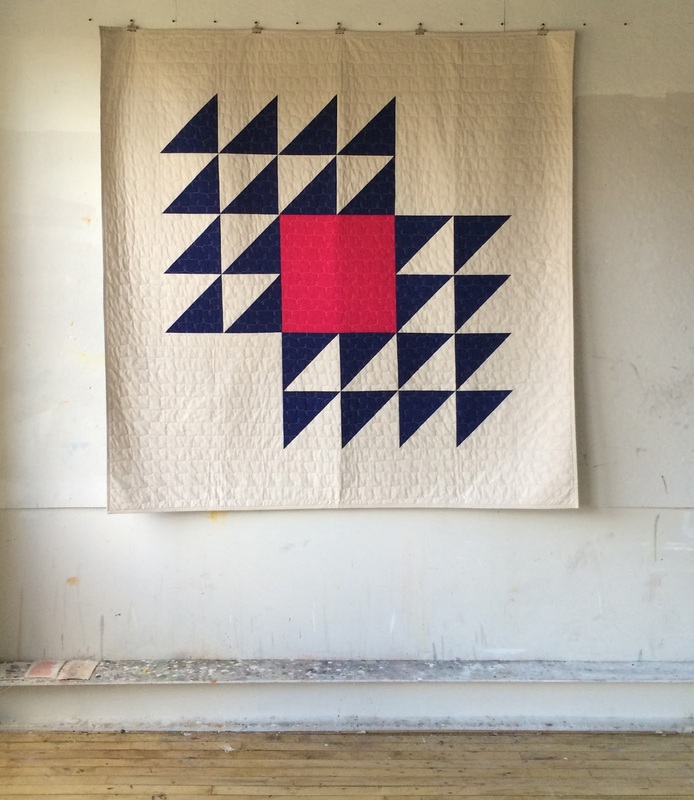 Food for thought: While I would certainly consider this quilt modern (Pixie Sticks), it follows a traditional grid (2x3). I liked the balanced look for this quilt since there's so much unbalance happening within the blocks already. 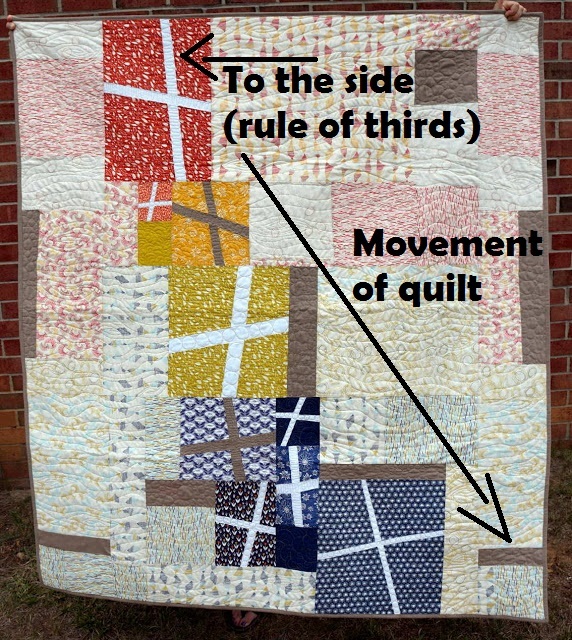 As a quilter, I rarely follow a pattern to a "T" (or at all). That is my own personal preference (mostly because I'd rather make up directions than follow them :) ). If you are used to following patterns, I encourage you to try your hand at rearranging the grid of your quilts. On the other hand, I've also intentionally worked with lots of traditional gridwork to build both skill sets. 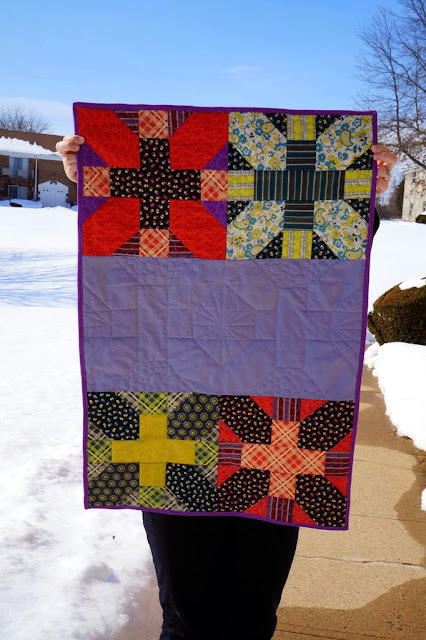 It can be thought-provoking, exhilarating, and nerve-wracking to lay out your quilts in a different way than what a pattern instructs - and it's worth trying! The black lines are the division of thirds, and the white ovals indicate where I placed my panels. Here's another of my quilts that nearly follows the rule of thirds; the bottom points are the focus. You can also set a block to the side to create impact. In Wanderer (below), I built a log cabin out from my improv cathedral windows, which are off center. 2. Intentionally create space down the middle of your quilt. One of the main reasons I jumped into the Sisters' Ten Quilt A Long by Anne Marie Cheny of Gen X Quilters a couple of years ago was because of her unique layout. I decided to make two quilts (one for me and one for my sister), which were made purposely in opposite ways to come together in a heart. I also added in some favorite scraps to the negative space that Anne Marie originally designed for the quilt. The traditional blocks are all there and shining brightly, but they are also arranged in a way that is visually pleasing and unexpected. 3. Enlarge a traditional quilt block. 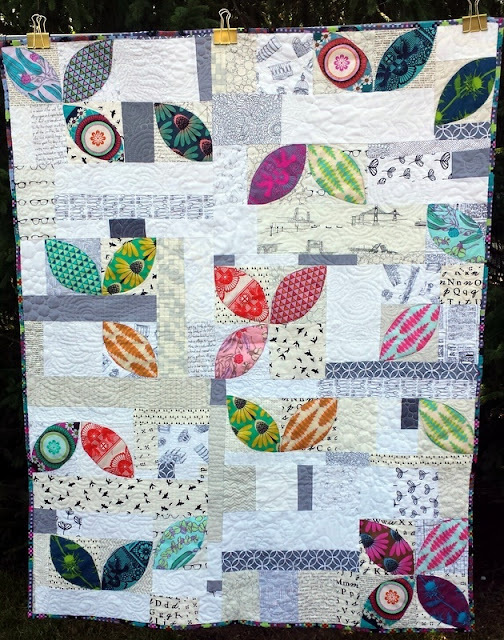 This one has infinite options - I mean, how many quilt blocks are out there? Heather Jones' "Fly Away" comes straight to mind. How striking is this? I recently designed this Mint and Gray baby quilt for a coworker, which features an enlarged wonky cross block along with smaller ones. You'll notice that the top and bottom borders are intentionally sized differently as well. 4. Sew a planned improvisational background. This is my specialty, and I teach classes about it! The basics: sewing different sized strips of color to create a backdrop. This can be combined with traditional blocks, too. 5. Leaving one space (or several spaces) open in your traditional grid. This is perhaps the easiest way to create an alternate look. If you are following a Block of the Month (BOM), you could space out your 12 blocks from the year in a traditional grid (like the 4x4 one below). 6. Place all your blocks at the top and bottom of your quilt. Or either one. 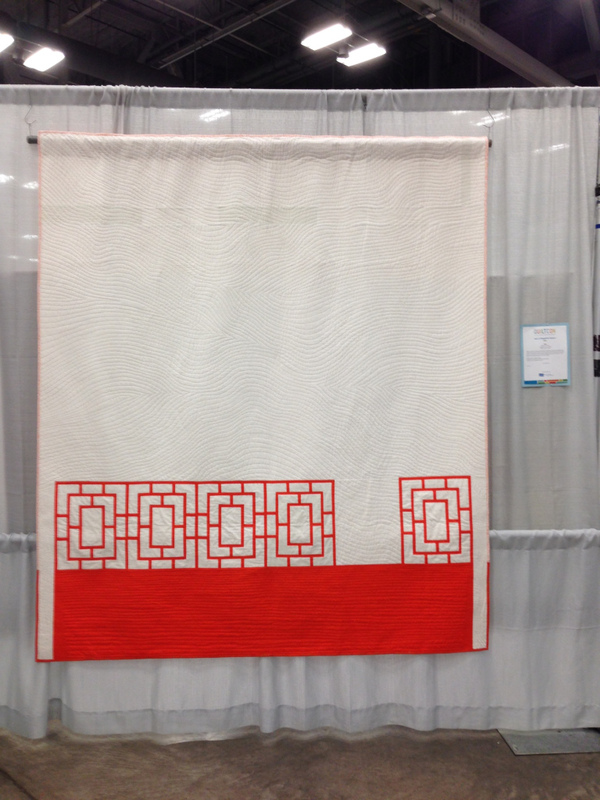 One of Melanie Tuazon's Peek quilts, which hung at QuiltCon this year, is the perfect example! Look, she also left out a space for one of the blocks. 7. Slice your blocks in half and add strips of fabric. I know this might be blasphemy to some, but it's freeing and fun. :) Not only will it change the size of your blocks, but it will force you to consider rearranging them differently if they are various sizes. I'd really like to try this with some really precise star blocks. I experimented with this when I made Pebble Cascade earlier this year. My little scrappy improv blocks by themselves just weren't cutting it... they were boring. I started slicing and dicing and then followed #8. 8. Surround your blocks in negative space. 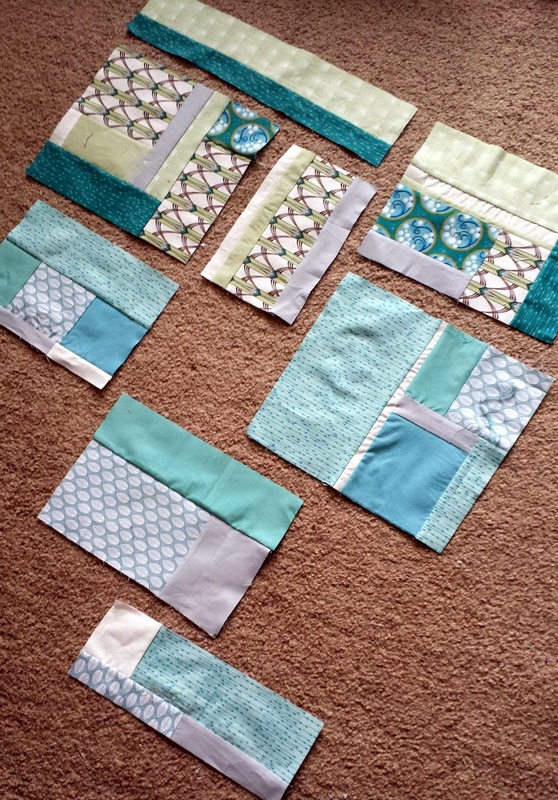 Just add enough space to sew the blocks into rows or columns. Then, the blocks float on the negative space! This technique, called variable framing, is taught by Jacquie Gering. A neutral color works well (like white, gray, tan), but heck, do whatever you want. It's your quilt. I consider purple a neutral. Anything goes! This is a traditional 3x4 grid, broken up with jelly roll strips and negative space. The blocks were sewn into four columns. 10. Get inspired! 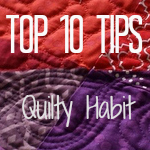 Look for inspiration on Instagram, blogs, and at quilt shows. 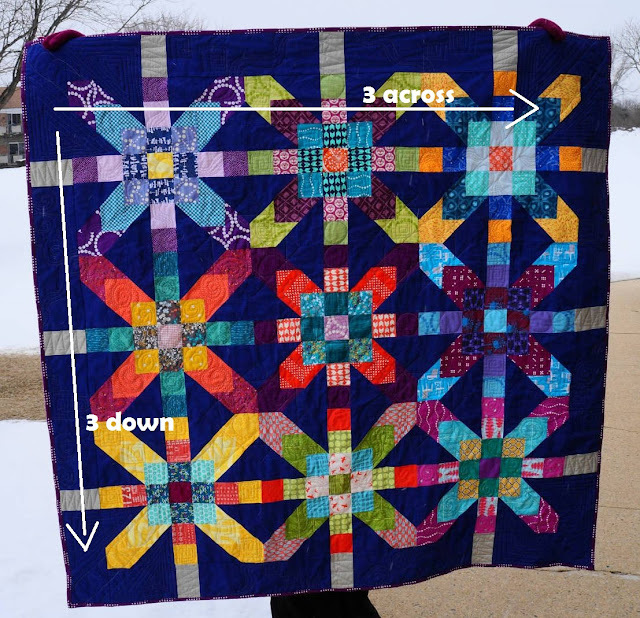 I highly recommend reading about QuiltCon 2015 and the MQG exhibit from International Quilt Festival 2015 for more examples of alternate gridwork. Also, the hashtag #modernquilting on Instagram is very inspirational! P.S. Have you noticed? Many of the winning quilts at QuiltCon 2015 followed an alternate gridwork style. More food for thought. Until I wrote the post and looked through my portfolio, I didn't realize I'd been using it so much! Comment below if you have more suggestions for quilters. Let's go forth and experiment with alternate gridwork! Great examples here, Jess. I am definitely a fan of the make a big block right now, but I plan to explore more of these options as I have time! Dear Jess, you are amazing. I love all of these quilts. I learned a lot here. Now I can go and explain my bold intrepid creativity with these superb technical terms. Excellent post Jess. 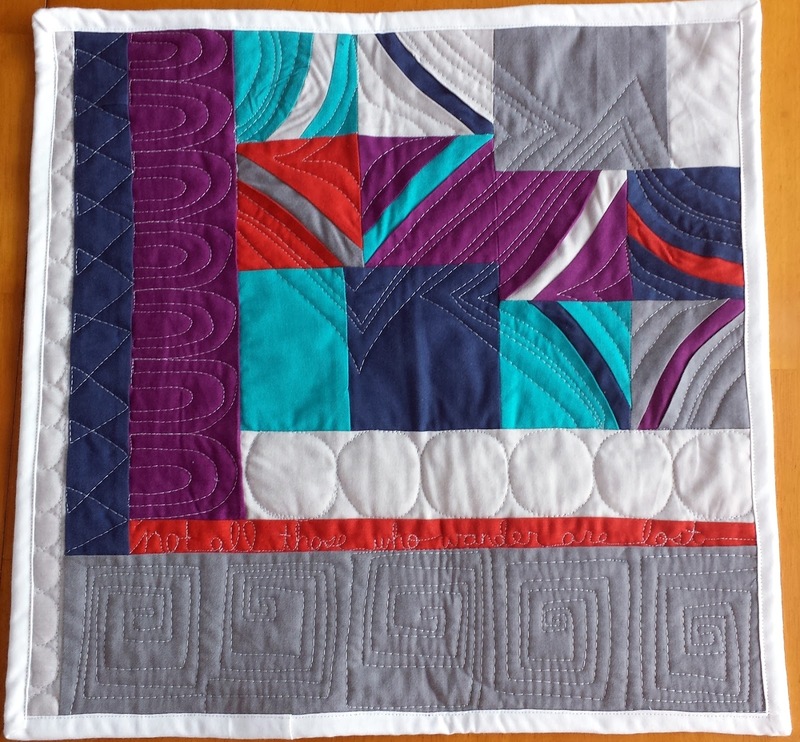 I've been quilting for 10+ years but only became aware and interested in modern quilting after receiving an iPad for my birthday last year then starting to follow blogs for the first time. This has greatly enhanced my understanding. Thank you. Excellent post, you took a complicated topic and really distilled it down into a super useful and and understandable post. This is a really great, inspiring post. I love the purple neutral of "Midsummer". 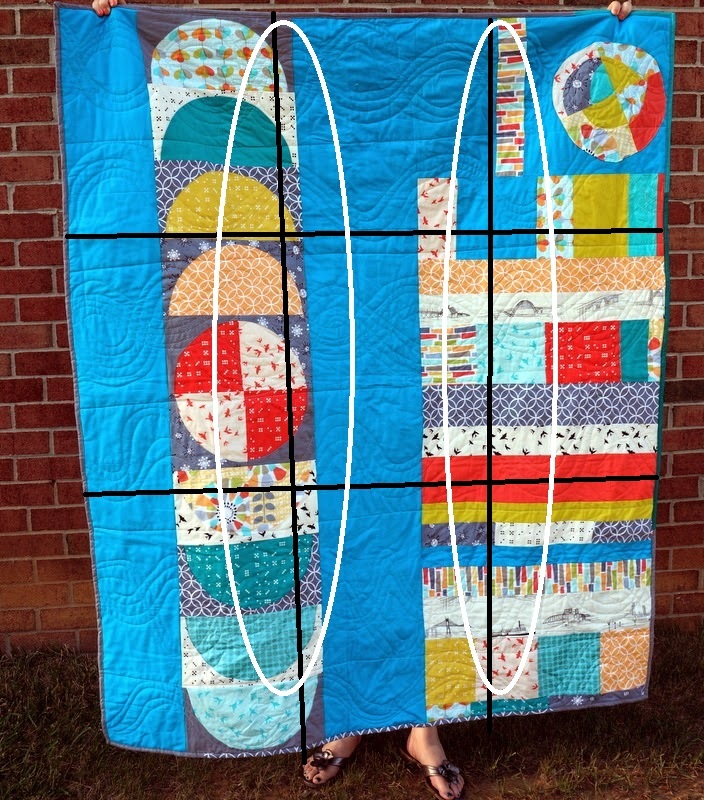 That quilt reminds me of ring magnets stacked on rods in different arrangements of attracting and repelling. Brilliant post! Not sure I've understood the rule of thirds (even though you've done your best to tell me) so if you ever feel like expanding that subject in the future I'm all ears (or eyes as it were). I will check out your other resource and do my best to work it out myself in the meantime. Many thanks!